On April 20, BP's deepwater Horizon exploded and BP was unable to activate to shut-off valve. After a number of attempts to shut down the oil spill, including (but possibly not limited to) Top Hat, Top Kill and Junk Shot, BP has still been unable to to stop the increase of the oil price. According to our anonymous sources, BPs next attempt to stop the flow of oil is called Whale Blow-Up. What is in the name? British Petroleum has contacted a majority of fisherman to catch them whales. The operation will be worked on in two different phases. British Petroleum, under tight supervision by the Obama government, is working on blowing up as many whales as possible and fill the oil tubes with whale meat, bones, babies, and everything else found inside a whale. Official press release is still to be written, but according to the current information, this operation is yet another nature-friendly way to stop the oil spill. They tried with mud, it didn't work. They added rubber balls, but the general population wasn't happy with the non-nature-friendly things in the water. So now they are trying something different. Whales. 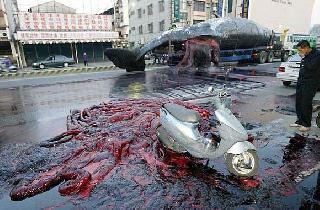 And as there are no chemicals inside whales, all environmentalists should like this operation. Should phase one turn out to be unsuccessful (which it probably will be, considering BP's past ability to deal with this disaster), they will be moving on to Operation Whale Blow-Up Phase Two. This time they intend to use alive whales. They drag the whales to the bottom of the Gulf of Mexico, attach oil tubes to the whales and use whales as carriers of oil to the ground. So far they have managed to put together a team of 10 000 whales. Once a whale has been filled with oil, it will be dragged up, emptied to BP's ships and sent down again for more oil. BP is confident (65%) that should Operation Whale Blow-Up Phase One not work, the operation's Phase Two (called Fill The Whale) will definitely (65%) work. Frogman has not been seen for centuries and BP is yet to find him. Should the unthinkable happen, however, and operation Whale Blow-up will end exactly as the past attempts to save the world, BP is prepared to launch operation Frogman. However, according to sources, the Frogman has not been seen for centuries and BP is yet to find him. May 6, Top Hat containment Dome. British petroleum tried to put a hat on the oil flow. Obviously, they failed. According to unconfirmed sources, the hat was made of spun yarn. May 26, Top Kill. BP tried to pump dense mud into the blowout preventer that is releasing the most oil. They almost succeeded, but...well, just almost. So they failed. May 26 (or 28, who knows), Junk Shot. BP decided to add rubber golf balls and scraps to the mud that goes into their leaking oil well. They did manage to popularise golf and bring it closer to the general public, but in terms of stopping the flow of oil, they were unsuccessful. The well has been spewing an average of 15 000 barrels of oil a day. All free for taking, just take your oil can with you. BP is losing loads of money, estimations are at about $24 million a day. Fortunately for us though, their last year's profit was $45 million a day. And if oil prices keep rising, they will end up not losing, but making money with this unfortunate incident.